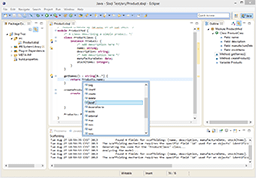 ODRA eIDE2 is a new version of the Integrated Development Environment for the ODRA. This edition is based on Eclipse and Xtext. ODRA eIDE2 uses Eclipse updating technology. (Stack-Based Architecture) is a formal methodology addressing object-oriented database query and programming languages. (Stack-Based Query Language) is a query/programming language following the SBA principles. is a prototype object-oriented database management system following the SBA philosophy and implementing SBQL. is a new version of the Integrated Development Environment for the ODRA. is a new version of a web framework for the ODRA. More information about SBA, SBQL and ODRA could be found on the official site: http://www.sbql.pl/.